Paul Thorp - the Thorp in Hansen Thorp Pellinen Olson, Inc. (HTPO) – has many passions, one of which includes volunteer work with the Eden Prairie Historical Society. 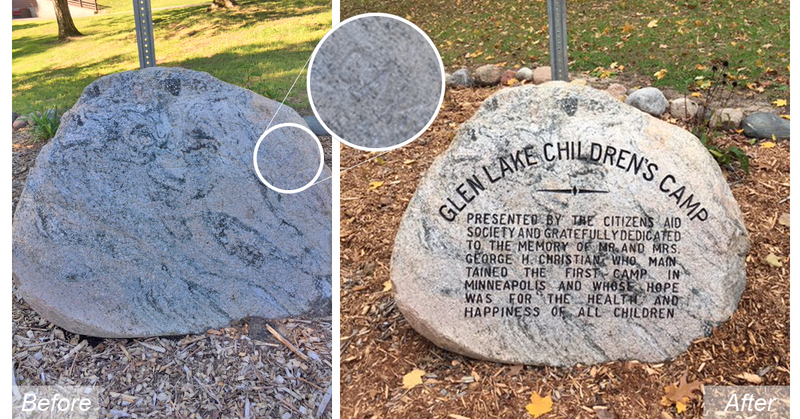 Most recently Paul took a personal approach and great enjoyment in repairing the Glen Lake Children’s Camp stone monument memorial. Over decades of exposure to the elements, the memorial’s engraved inscription became faded; Paul meticulously hand-stained each engraved letter this year, bringing back its original luster. The restoration was a joint effort by the Eden Prairie Community Foundation, Eden Prairie Heritage Preservation Commission and Eden Prairie Historical Society. Glen Lake Children’s Camp, was a facility for children diagnosed or exposed to tuberculosis until it was closed in 1950 after antibiotic treatments for the disease were discovered. Currently, portions of the property are on the National Register of Historic Places and the facility is operated by True Friends as Camp Eden Wood, a camp that serves people with physical, developmental and learning disabilities.